The Bennetts: An Acting Family is a chronicle of one of the royal families of stage and screen. The saga begins with Richard Bennett, a small-town Indiana roughneck who grew up to be one of the bright lights of the New York stage during the early twentieth century. In time, however, Richard's fame was eclipsed by that of his daughters, Constance and Joan, who went to Hollywood in the 1920s and found major success there. Constance became the highest-paid actress of the early 1930s, earning as much as $30,000 a week in melodramas. Later she reinvented herself as a comedienne in the classic comedy Topper, with Cary Grant.. After a slow start as a blonde ingenue, Joan dyed her hair black and became one of the screen's great temptresses in films such as Scarlet Street. She also starred in such lighter fare as Father of the Bride. In the 1960s, Joan gained a new generation of fans when she appeared in the gothic daytime television serial Dark Shadows. 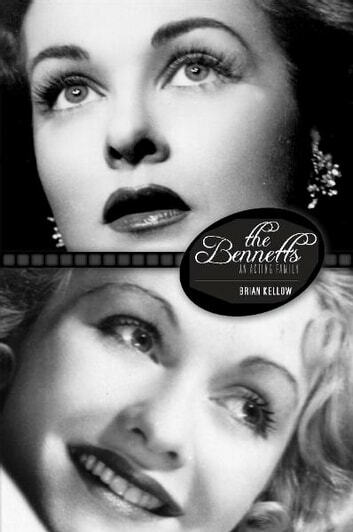 The Bennetts is also the story of another Bennett sister, Barbara, whose promising beginnings as a dancer gave way to a turbulent marriage to singer Morton Downey and a steady decline into alcoholism. Constance and Joan were among Hollywood's biggest stars, but their personal lives were anything but serene. In 1943, Constance became entangled in a highly publicized court battle with the family of her millionaire ex-husband, and in 1951, Joan's husband, producer Walter Wanger, shot her lover in broad daylight, sparking one of the biggest Hollywood scandals of the 1950s. Brian Kellow, features editor of Opera News magazine, is the coauthor of Can't Help Singing: The Life of Eileen Farrell. He lives in New York and Connecticut.